Concerts Penzance welcomes cellist Richard Lester to St. John’s Hall on Saturday 12th November at 7.30pm, to lead a varied concert celebrating the music of Johann Sebastian Bach and his sons Wilhelm Friedemann Bach and Carl Philipp Emanuel Bach. Opening with one of JS Bach’s suites for cello alone, Richard Lester is joined by Concerts Penzance founder Tim Boulton to perform a collection of JS Bach’s Two Part Inventions and Fugues. The two musicians, who were colleagues for nearly a decade in the award winning piano quartet Domus, also perform music by WF Bach, and Richard is joined by Penzance Youth String Orchestra to perform CPE Bach’s effervescent Cello Concerto in A major. 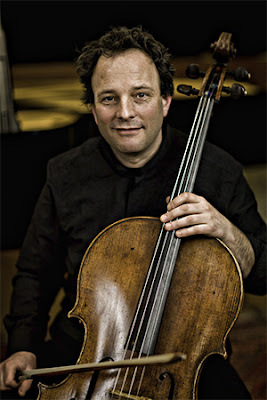 Richard Lester is a leading chamber-musician, solo-cellist, orchestral principal and renowned teacher, appearing regularly at many of the world’s foremost concert venues and festivals. He has made over forty discs of chamber music, winning a host of accolades including two Gramophone awards and the Royal Philharmonic Society award. As a soloist he has appeared with many of the top orchestras in Britain and abroad. He was a member of the highly regarded Florestan Trio, a founder member of Domus, and has been a member of Hausmusik, the London Haydn Quartet and a frequent guest with the Nash Ensemble. Richard Lester is equally at home performing on ‘period’ instruments as well as performing with a ‘modern’ set up, giving him special insight into the music of Bach’s time. He has been principal cello with the Chamber Orchestra of Europe since 1989 and was for many years principal with the Orchestra of the Age of Enlightenment.